HERSHEY - After watching Reading receive its first-place medals on the opposite end of the court, the Central York boys' basketball players made their way to the locker room to gather their things. The Central fans who had stayed in the Giant Center cheered as the Panthers left the court following Saturday's 65-54 loss to Reading in the District 3 Class AAAA final. It was Central’s first trip to the district finals since 1984, and the Panthers hung with the favored Reading Red Knights, even battling back from double-digit deficits twice before ultimately falling. 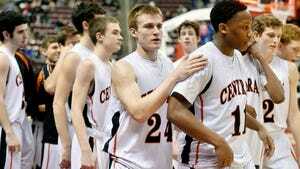 “I just told them in the locker room I’m so proud of them,” Central head coach Kevin Schieler said. “I think the entire first half was us adjusting to (Reading’s) quickness. They’re the quickest, longest, most athletic team we’ve seen this year. I just don’t think we were ready for it in the first half. It was an uphill battle from the start for Central, which fell behind early. Reading led by three at the end of the first quarter before putting up 16 second-quarter points to take a 13-point lead into halftime. However, a switch flipped for Central in the second half. The Panthers opened the quarter with back-to-back 3-pointers from Nathan Markey, who finished the game with a team-leading 19 points. Later in the third, Markey hit two foul shots and Courtney Batts followed it with a long-range shot to pull the Panthers within a point. But Reading built up a 10-point margin early in the fourth quarter until Central staged another rally. The Panthers closed to within five points before the Red Knights pulled away for good. Reading now has 20 district titles to its name, along with one of the best players in the state in Lonnie Walker. The junior guard finished with a game-high 25 points, with 16 coming in the second half. Central’s job wasn’t made any easier on Saturday afternoon when Jared Wagner took a shot in the back early in the first quarter. He was in visible pain after the play and had to leave the game for several minutes. Wagner did return to action and finished with 11 points, but Markey and Onterio Edmonds led the way for the rest of the contest. The Panthers will now turn their attention to the state tournament where they will face Central Bucks West, the sixth-place team from District 1. “Just be ready to. The next game is always the most important game,” Markey said about the state tournament. Khary Maruras 6 45 17, Lonnie Walker 9 5-6 25, Stern 1 3-4 5, Cook 0 0-0 0, Oenis Medina 3 4-6 10, Starks 2 0-0 6, McCutchen 1 0-0 2 Dixon 0 0-0 0. Totals — 22 16-21 65. Onterio Edmonds 4 5-5 14, O’Neill 0 2-3 2, Nathan Markey 6 4-4 19, Jared Wagner 3 5-6 11, Sobestanovich 0 0-0 0, Batts 3 1-2 8, G. Markey 0 0-0 0, Ray 0 0-0 0, Czulada 0 0-0 0. Totals — 16 17-20 54. 3-point goals — Reading 5 (Walker 2, Starks 2, Mauras), CY 5 (Markey 3, Edmonds, Batts).